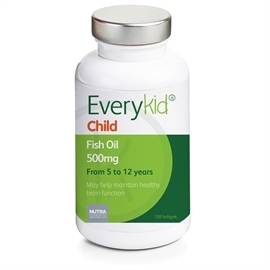 Everykid Children's Fish Oil 500mg provides the necessary levels of both eicosapentaenoic acid (EPA) and docosahexaenoic acid (DHA), to help contribute towards normal brain function in children. Omega 3 fish oils are rich in the essential fatty acids eicosapentaenoic acid (EPA) and docosahexaenoic acid (DHA), which support general growth and development in children. Studies show that consuming 250mg DHA daily as part of a healthy lifestyle contributes to normal brain function. DHA is an essential building block for developing cell membranes and supports the normal formation of signal pathways and other neurological systems. As a result, it plays a key role in the development of a healthy brain. DHA also contributes to the normal development of the eye and therefore promotes healthy vision. Vitamin E acts as an antioxidant to help protect cells against free radical cell damage which could also affect vision. Is Everykid Children's Fish Oil 500mg Right For Your Child? Children can be fussy eaters. And while the Department of Health advises children eat two portions of fresh fish per week, this may not always be feasible due to their dislike of the fish taste or smell. Yes, omega 3 can be obtained through diet alone, but if this is not possible, then a high-quality fish oil supplement can help to provide you child’s recommended omega 3 daily intake. (1) Omega-3 Fatty Acids Supplementation in Children with Autism: A Double-blind Randomized, Placebo-controlled Pilot Study: G. Paul Amminger et al, Biological Psychiatry, Volume 61, Issue 4, 15 February 2007. There is increasing evidence that fatty acid deficiencies or imbalances may contribute to childhood neurodevelopmental disorders. A randomized, double-blind, placebo-controlled 6-week pilot trial investigating the effects of omega-3 fatty acids supplementation in 13 children (aged 5 to 17 years) with autistic disorders accompanied by severe tantrums, aggression, or self-injurious behaviour. The outcome measure was the Aberrant Behavior Checklist (ABC) at 6 weeks. We observed an advantage of omega-3 fatty acids compared with placebo for hyperactivity and stereotypy, each with a large effect size. Repeated-measures ANOVA indicated a trend toward superiority of omega-3 fatty acids over placebo for hyperactivity. No clinically relevant adverse effects were elicited in either group. Conclusion: The results of this study provide preliminary evidence that omega-3 fatty acids may be an effective treatment for children with autism. (2) Omega-3 Fatty Acid Supplementation for the Treatment of Children with Attention-Deficit/Hyperactivity Disorder Symptomatology: Systematic Review and Meta-Analysis, Michael H. Bloch et al, J Am Acad Child Adolesc Psychiatry. 2011 Oct.
To examine the efficacy of omega-3 fatty acid supplementation in children with ADHD. Ten trials involving 699 children were included in this meta-analysis. Omega-3 fatty acid supplementation demonstrated a small, but significant effect in improving ADHD symptoms. Eicosapentaenoic acid (EPA) dose within supplements was significantly correlated with supplement efficacy. Conclusion: Omega-3 fatty acid supplementation, particularly with higher doses of EPA, was modestly effective in the treatment of ADHD. Given its relatively benign side-effect profile and evidence of modest efficacy, it may be reasonable to use omega-3 fatty supplementation to augment traditional pharmacological interventions or for families who decline other psychopharmacological options. Health Article: Daily Mail: Which Fish Oil Brands are best for Children? Fish oils are the new health 'wonder' food - not a week goes by, it seems, without yet more research confirming how good they are for you. Not only do they help children with learning difficulties such as dyslexia, ADHD and dyspraxia, and adults with conditions as schizophrenia and depression, fish oils protect the heart and reduce the pain of arthritis. Then last week a study, found that regular doses of fish oils dramatically boosted young children's performance at school. Nearly three quarters of the youngsters - who were of mixed academic ability - showed improvements in numeracy, reading and writing after taking fish oil supplements for nine months. "With no placebo group, we don't know what progress they would have made anyway" says Dr Alex Richardson, a Senior Research Fellow from Oxford University. "But these findings are in line with other evidence that fish oils really can improve behaviour and learning in many children." It is the Omega-3 fatty acids - specifically EPA and DHA - they contain that make fish oils so beneficial. Unfortunately the body can't make Omega-3s; the best source is oily fish. But the problem, as most parents know, is that children don't like it, so Omega-3 supplements are becoming a popular option. Traditional cod liver oil is not particularly rich in EPA and DHA; it also contains the fat-soluble vitamins A and D, that can be toxic in excess, so high doses are not advisable in the long-term. Some fish oil supplements also contain these vitamins so ask you GP before attempting to increase dosage. There is no clear rule about how much EPA and DHA your child should take. "About 450-500mg per day combined EPA/DHA is a reasonable target for both adults and children" says Dr Richardson. "Some may need even more to see real benefits - but I wouldn't recommend more than 1,000mg without expert supervision." There should be no serious danger of your child over-dosing on fish oils, but an excess can cause a stomach upset, and some people may be allergic to them, so discuss any worries with your doctor. What Makes Everykid Children's Fish Oil 500mg better than Other Children’s Fish Oil Supplements? Each 500mg softgel capsule provides suitable levels of EPA and DHA which are effective and safe for children as young as 5 years old. Blended with Vitamin E for added health benefits. Softgel formulation easier to swallow. Recommended by our health experts Everykid Children's Fish Oil 500mg has been developed by clinical healthcare experts. The ingredients have been carefully formulated with research to ensure they deliver results. Everykid Children's Fish Oil 500mg is also recommended by nutritionists. Fish Oil (FISH) 500mg. Providing (Typical Analysis): EPA (Omega-3) 90mg, DHA (Omega-3) 60mg, Vitamin E (7.45iu) (dl-Alpha-Tocopheryl Acetate). Softgel Capsule Provides: Gelatin (Bovine) 119mg, Glycerin 48mg, Purified Water 14mg. Allergy Advice: Contains No: gluten, lactose, wheat, added preservatives, artificial colouring. For allergens see ingredients in (CAPITALS). As a food supplement, take 1 to 2 softgels daily or as directed by a healthcare professional.